Did you know that Asa Ransom House is located just 28 miles from Niagara Falls? This is a must-see attraction listed on many travelers’ bucket lists. We want to help you cross it off of yours with our recommendations of the best things to do in Niagara Falls, NY. 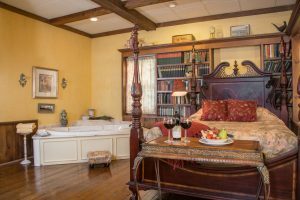 Our location in Clarence, NY, allows visitors to easily spend the day at Niagara Falls and then return to Asa Ransom House for rest, relaxation, and more enjoyment. 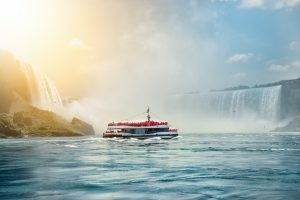 When you’re not immersed in exploring the things to do in Niagara Falls, we invite you to discover numerous additional activities and attractions in our area. Fill up your itinerary with the best restaurants, shops, historic sites, romantic activities, and much more. You may end up extending your stay just to experience it all! You can explore Niagara Falls in a variety of ways. Maid of the Mist boat tours are one of the most popular ways to see the Falls and has been safely guiding passengers since 1846. Many people do not know that Niagara Falls actually includes three major waterfalls, including Horseshoe Falls, American Falls, and Bridal Veil Falls. The tour gives you a unique perspective of these that you won’t find anywhere else. The tour does provide complimentary rain ponchos to customers. Still, it’s a good idea to dress appropriately. Maid of the Mist also welcomes passengers of all ages. This makes it a great option for things to do in Niagara Falls with kids as well. Prone to seasickness? Don’t worry! You can also marvel at this natural spectacle via walking tours, bus and trolley tours, and even on a bike tour. A bridge above the American Falls gives cars and pedestrians access to Goat Island and its several viewpoints, and the Rainbow Bridge spans the river just downstream of the falls. Walking paths and observation towers on both sides of the river offer scenic vistas. For things to do in Niagara Falls at night, plan to visit after the sun sets when the falling water is illuminated by multicolored lights. Time can easily get away from you while appreciating the natural beauty of the waterfalls. When hunger strikes, be sure to check out the area’s wonderful restaurants nearby. Although there are many excellent establishments, we often recommend the Top of the Falls restaurant. Located on Goat Island on the Niagara River, this one-of-a-kind eatery lets you dine while gazing out at their scenic view overlooking the Falls. Their stunning location is equally matched by their delicious cuisine of modern American meals and classic dishes. 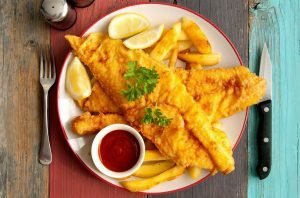 There are also a variety of other restaurants with different styles, including the Niagara Falls Hard Rock Cafe, Fortuna’s, Casa Nova Ristorante, and many more! You will have no trouble satisfying your appetite. Wine-lovers, rejoice! Niagara Falls is also located along a popular wine trail. The unique geography and climate of this region cultivate excellent vineyards to produce exquisite wines. With over 20 wineries to choose from, you may want to devote an additional day to the area and take a wine tour. If you’re short on time, be sure you at least visit Long Cliff Vineyard & Winery, Black Willow Winery, A Gust of Sun Winery & Vineyard, Arrowhead Spring Vineyards, and Lake Ontario Winery & Vineyards. These are all good options for things to do in Niagara Falls for couples looking for fun and romantic activities. Don’t worry, beer-drinkers, there are also a number of highly recommended breweries in the area. Check out Brickyard Brewing, Becker Brewing, and Live Edge Brewing. You can also check out the annual Old Falls Oktoberfest for fun celebrations nearby. There are many more things to do and places to see near Niagara Falls, NY. Here are a few more attractions to round out your Niagara getaway. Artpark offers a range of summer events at its mainstage theater, theater terrace lounge, and outdoor amphitheater on the heights of the Niagara River Gorge. Check the schedule for Broadway musicals, celebrity performances, free concerts, and more. Old Fort Niagara, a New York State Park and National Historic Landmark, is one of the most popular attractions in the area. Learn how this historic fort at the entrance to the Niagara River shaped the future of the United States, Canada, and the Iroquois Six Nations people. Niagara Power Vista invites visitors of all ages to explore the world of hydroelectricity with interactive exhibits and spectacular Niagara River Gorge scenery. Witnessing the natural beauty of Niagara Falls is something everyone should do at some point in their lives. The combination of awe-inspiring waterfalls, delicious food and drinks, and fun activities makes this area a must-see. Book your stay at Asa Ransom, only 28 miles from Niagara Falls, and enjoy a once-in-a-lifetime vacation experience. After exploring there, you can discover the wonderful things to right here in Clarence as well! Check the availability of our guest rooms and book your next getaway now. Don’t forget to check out our specials and packages!